Here we are! Book number five and still not enough! How does she do it? 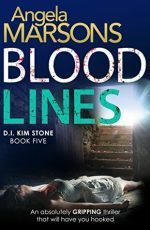 Blood Lines is the fifth book in the DI Kim Stone series. And Angela Marsons did it again! I still can’t get enough of her books. With every book next in the row, the author makes me more and more addictive to her writing. I absolutely love her books. This time, Kim Stone’s arch enemy is back. Alex Thorne is in prison, but she still feels like the puppet master and has a plan: to destroy Kim Stone. She plays with human minds, she knows which buttons to push. Anything to get what she needs. Kim and Bryant have a tough case to solve. A woman has been killed, probably a robbery went wrong. But everything is there, every piece of jewellery, every single pound in the wallet. Who wanted the murder to look like a robbery? But when a young girl, a local drug addict, is killed the same way, Kim knows that these two cases are connected. Nothing connects the two victims, except the way they were killed. Are these killings work of a serial killer? In the very same time, Kim’s private life turns upside down. Her mother has been in a mental hospital for years since she killed Kim’s little brother. Now, Kim receives a note that her mother is going to be released. Her behaviour has been very much improved since Kim started to send her letters full of forgiveness. But Kim hasn’t sent a single piece of paper. What the hell is going on? Wow! If I have to explain this book with one word, it would be WOW! If I have to explain this book with three words, they would be OH MY GOD! I can’t stop reading till finishing it! It is fifth in the series and I still can’t get enough of it. I have no idea where the author finds the inspiration and the energy for so many books for such a short time, but she is amazing. Angela Marsons definitely knows her job and knows how to keep your hair stand on the neck till the very last page. READ THE BOOK! I TOTALLY RECOMMEND IT! My opinion: 5 / 5.